I’ve never participated in No Shave November. There are people who do. Beard-growers glory in No Shave November, and so do those eager to put away the razor and let the leg locks run wild. Good for them, I say. Way to TAKE A BREAK from being sheared and shorn and neat and tidy. Way to say ADIEU to expectations. Way to find REST and RESPITE from the Usual, Methodical Things we think we Have to Do. But I’m something of a compulsive shaver. I actually enjoy it the way some strange folks like to fold sheets or put away underwear or vacuum under the couch. It’s a task that gives me pleasure, so I’m bypassing No Shave November. And even though I’m a writer and a fan of books, I’m not participating in NaNoWriMo (National Novel Writing Month), either. It’s a fantastic discipline, writing 50,000 words by month’s end. A great way to jumpstart a writing practice. But that’s not going to work for me right now, and I’m learning I don’t have to partake in every good thing, so I’m laying down that one, too. I thought about what I DO need right now. And what might have the BIGGEST impact if I did it for four full weeks diligently. I’ve decided on No Shame November. I was laying on my back this morning, on a thin rug on the living room floor, practicing Mindful Breathing under the direction of my friend, Heidi, at our annual Mindfulness Retreat. * The Pacific Ocean played its static dissonance in the background, and Heidi asked us to put our hands on our bellies to feel ourselves breathe. My friend, K, mentioned later how horrible that was — to have to touch her belly. To feel like it’s too big. To feel yucky and ashamed. And I understood what she meant because me, too. I put my hands on my belly this morning and thought about how my waistband bent and my tummy bubbled over it. I thought about how my elbows don’t rest on the floor completely when my hands are in the middle of my belly because my gut pulls my arms ever-so-slightly up and leaves the elbows suspended. I thought those things, and then I let them go when Heidi reminded me to feel my breath, instead, rising and falling and rising and falling, and I tried to give myself gentleness and compassion. Which is what mindfulness is at its core — paying attention, noticing, then responding with love. It’s a muscle to strengthen, Seeing the Things, nodding to them kindly, and letting them go. Rising and falling. Over and over. So here’s what we’re going to do, those of us who need this practice rather desperately. We’re going to practice No Shame November. We’re going to see what comes. What feelings. What thoughts. What joys and sorrows and judgements. And then we shall note them. “Ah! There’s anger.” “I feel sympathy.” “I see you, Fear.” We shall note them, and, while we may have judged them good or bad, we will let them go at the noticing and not continue to cling to them and berate or shame ourselves. “Judgement! There you are! I see you. Let me hold the door for you on the way out.” We shall note them and let them pass. Greeting all the pieces of ourselves with curiosity instead of shame. Showing love to ourselves where we’re been rather mean in the past. Forging a new path of kindness and generosity as though we’re worth it like everyone else. BECAUSE WE ARE. Now, here’s the trick — we’re also not going to feel shame about feeling shame. We’re going to simply notice when we feel shame — like, “Oh! Hello. There you are again, Shame.” — and then we’re going to be compassionate to ourselves. And breathe in and out. Rising and falling. Rising and falling. And teaching ourselves a new way to love. *2019 Retreat info coming soon! “Seeing the Things, nodding to them kindly, and letting them go.” Thank you for this. I get stuck after I see the things. But put this way, nodding to them kindly, feels doable. So I did it to my squishy belly, right here at the computer, for practice. I love this, Beth! Especially the part about not feeling shame when we feel shame. So important to remember! Sending love! I like doing daily gratitude challenges in November. It seems fitting, with Thanksgiving during the second half of the month. 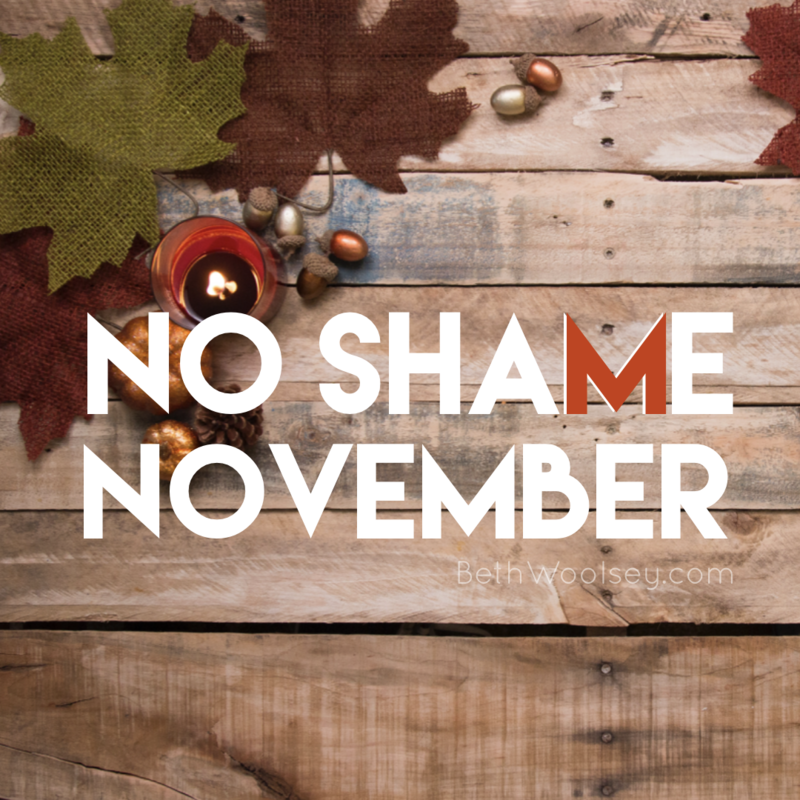 No shame is good, too. Oh, and I didn’t shave during October at all, so I’m going to count that as an early “No Shave November” — ha!